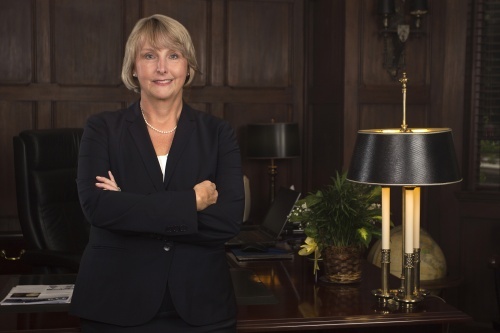 Dr. Kathy Brittain Richardson became Westminster College’s 15th president on July 1, 2016. Before coming to Westminster College, Richardson was provost and professor of communication at Berry College, Mt. Berry, Georgia. She served as the chief academic officer, which included responsibility for working with six deans to coordinate management of the four academic schools and division of nursing and providing oversight to some 250 faculty and academic staff. Building bridges has been on our mind this year. With support from a Commonwealth grant, we replaced the public bridge over McClure Run Creek on the public road that connects the north and south areas of campus. The new bridge is strong, secure and beautiful. A bridge on Route 208 that runs through New Wilmington was replaced at the same time. For several weeks this summer, both bridges were out as construction crews worked. Detours and some delays were inevitable, but the new bridges offer connection, convenience and safety. We’ve been focused on building other types of bridges as well. This fall, we introduced Westminster 101 as a new required course for first-year students to provide a focused transition, or bridge from high school to college. Students gain insights into the skills needed for college success, from study skills to time management to personal finance. First-years continue to take the foundational Inquiry course that fosters an understanding of the liberal arts and sets the tone for academic life at Westminster. The Student Affairs division has been restructured to provide more support for residential communities and student organizations to help students build new and stronger relationships across campus. Similarly, Academic Affairs has been restructured to provide more connections. Seven schools now connect faculty within departments; they link similar programs to make it easier for prospective students to identify areas of interest and current students to find resources and offices. We like to think of this as the infrastructure for success. More prominent bridges are being established between students and their post-graduation plans. The former Career Center has been renamed the Professional Development Center and has moved to the main floor of the McKelvey Campus Center; new software programs like “Handshake” give students greater networking capacity. We’re piloting the WE Connect program with our current senior class, inviting interested students to connect with an alumnus or alumna for advice about job seeking, post-graduation moves or grad school applications. The Professional Networking Symposium, held on campus in September, offered students an opportunity to interact with employers and alumni who want to help current students with internships and career opportunities. In the recent National Survey of Student Engagement, more than 78 percent of the Class of ’18 respondents indicated that they had completed two or more high-impact learning experiences like an internship, practicum or job experience, a valuable bridge to their careers. The campus medical and law advisory committees help aspiring students prepare for professional school applications—and 100 percent of the 2018 applicants for medical, dental or law school were accepted. We’re also seeking to foster greater connections among our alumni. Along with the wonderful Homecoming activities you’ll read about in this magazine, many other bridge-building events are available across the country. The Titan Resurgence event in Pittsburgh targeted former athletes and friends of Titan Athletics; networking gatherings after work in cities across the country offer opportunities for alumni to interact, building upon the strength of the “WE in Westminster” that characterizes Titan alumni. Alumni Council, which represents alumni from across the country, continues its strong work communicating with and planning activities that help tie Titan graduates together and coordinating a variety of volunteer, network, and philanthropic opportunities that help alumni support current students. In New Wilmington, we have been reminded about the importance of good bridges. The historic mission of Westminster College reminds us of our calling to help students cross from high school to lives of purpose, with the “characteristics, commitments and competencies” that distinguish humankind at its best—perhaps the most important bridge we can ever build at Westminster.